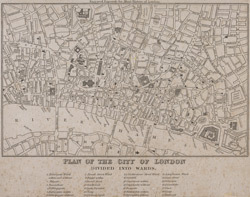 This plan was published in Allen's 'History of London' of 1828. Its title and a list of the city wards feature below the plan, with ward boundaries indicated by a dotted line. City wards were created in the Norman era with aldermen elected for life for the purpose of government. Ward 'beadles' were employed full time with responsibility for the "preservation of peace, supervision of trading, sanitation and local upkeep".